This seedling of Julia Child puts a whole new spin on 'flower power'. 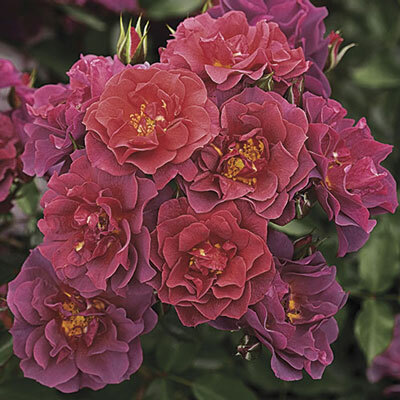 The clusters of blooms never stop poppin' open on this powerfully flowerful Floribunda. Mysteriously colored & deliriously novel…it's an indescribable blending of smoked lavender & rusty red-orange. Yet it's perfectly blendable with any color in the garden, whether it's atop a rose tree, planted in mass or nestled amongst your favorite perennials. The super-clean glossy-green foliage mirrors the flowers, adding even more pizazz to this bushy rounded flower factory. Smokier when it's cool outside. Available budded & own-root.